Do you remember back in 2014, when Pantone announced that the colour of the year was Radiant Orchid? 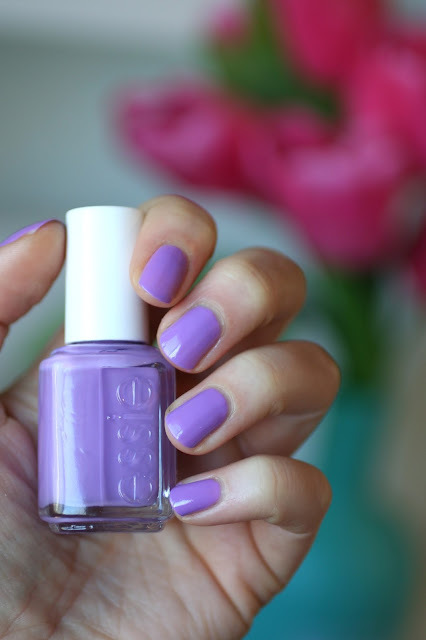 I totally had plans on writing a blog post on the best Radiant Orchid Essie polishes that Spring but....then I went and had a baby (my fourth) and I ended up taking about a year long hiatus from this blog. 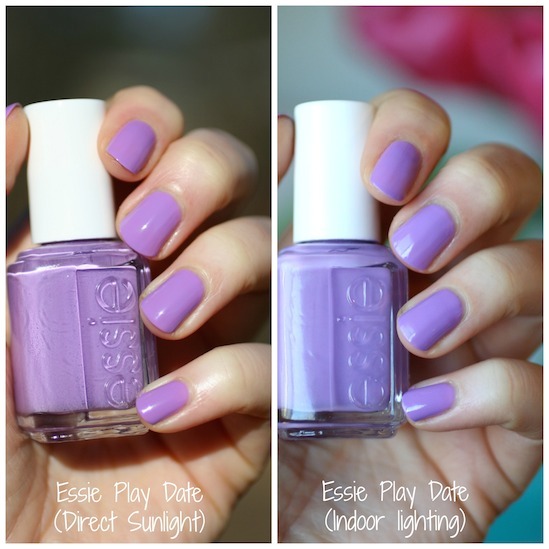 But if I had written that blog post, Essie Play Date would NOT have been on it. Really it should have been. Everyone else was blogging about Essie Play Date as the perfect radiant orchid polish, but every time I saw swatches of it I thought it looked way too pink-toned for me to like it. 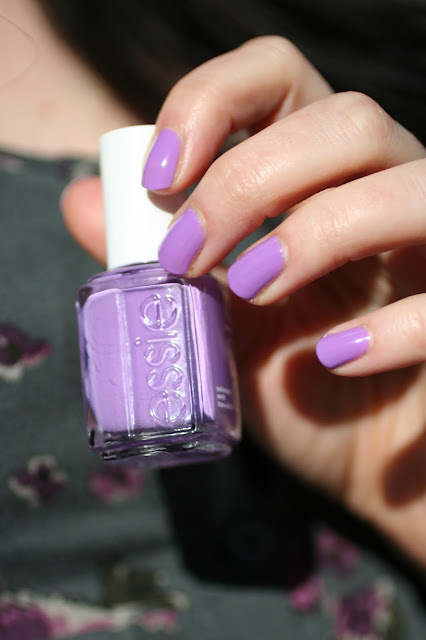 The polish I fell head over heals in love with that summer was Essie Sittin' Pretty from the Too Taboo Neons Collection. Now that polish was GORGEOUS. A soft, yet bright, medium toned purple that leans ever so slightly blue...not like Play Date. I borrowed Play Date from my friend Austrian a few weeks ago so I could compare it to the new Spring collection purple called Shades On. When I went to put it on, it absolutely shocked me. It's waaaaay closer to Sittin' Pretty than I realized. 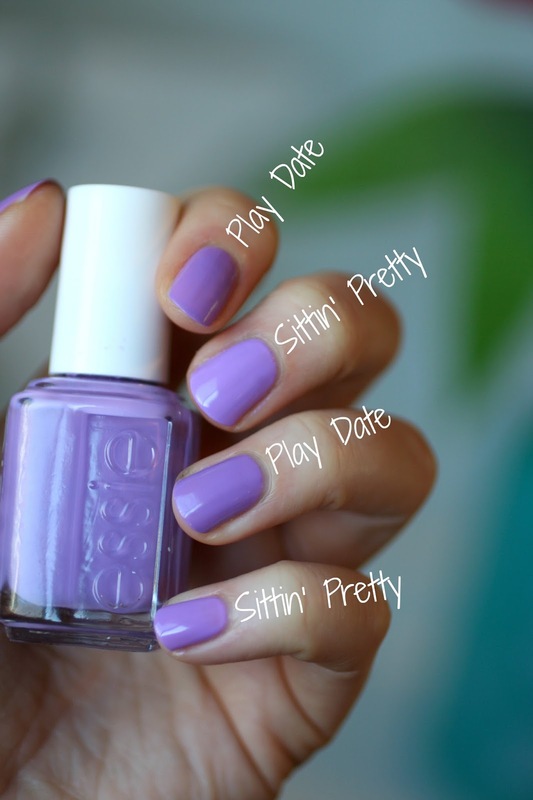 Sittin' Pretty has a very thin formula that isn't nearly as opaque as Play Date. It needs 3 coats. Sittin' Pretty is just a tad lighter and a slight hair cooler. But Play Date is definitely not the super pink-toned purple I thought it would be. Essie Play Date is easy to find since it's part of the permanent collection. Now the question for me is: do I purchase it for my own collection? This bottle of Play Date is still on loan from Austrian but since the colour and awesome formula surprised me so much, I may want a bottle for myself! What are your thoughts on Essie Play Date? Ooh! I've seen Play Date in stores and I always think that I have something similar to this. But honestly, looking thru my collection I either have something way darker or way lighter than this, thanks for the review! It really helps to see what the colors look like in different lighting. I appreciate it! Mrs W - glad you liked it!